I've publicly lamented the lack of good art instruction in our Lutheran schools, especially for younger children, and until recently, I knew of no admirable programs to hold up as examples. A few weeks ago I attended the 15th Consortium for Classical Lutheran Education (CCLE) conference, in Keller, TX. As a faculty member of Wittenberg Academy, I was invited to this fantastic event that I otherwise would never have heard of. The conference was an all-around enjoyable and enriching experience, but the art program at Messiah Lutheran Classical Academy was unbelievably good. 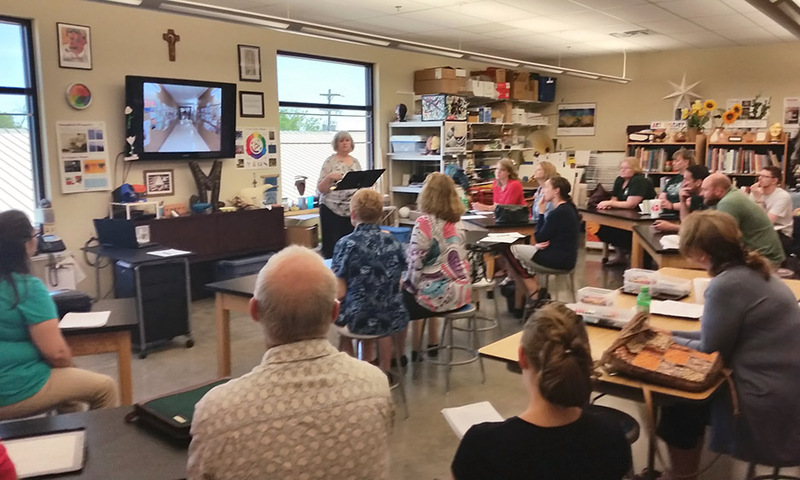 Marcia Huebel, the art teacher at Messiah Lutheran, gave the workshop on teaching art, which I attended. 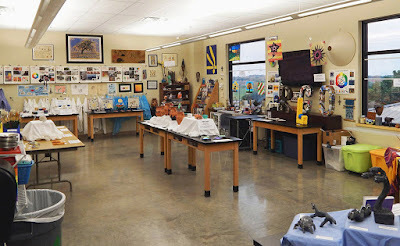 I don't know what I was expecting—I suppose a better-than-average art program, if only because classical schools have a reputation for setting high standards. But I don't think I could have imagined what they're accomplishing in that school, if I hadn't seen the results firsthand and spoken with the teacher who made it all happen. This was categorically, fundamentally different from any art program I've seen or even heard of. In K-1st grade, the students begin learning the basic elements of art—line, color, shape, value—things that every work of art are made from. They have art projects that utilize these elements, but of course, in the early years, a big part of what they are learning is the ability to listen to directions and develop hand-eye coordination. Maybe the expectations are not high, but it's a far cry from "craft time" with no real objectives and no learning value. Surprising to me was that already in 2nd grade, MLCS students start learning art history along side the art theory. (Second grade! I didn't learn a lick of art history until college!) 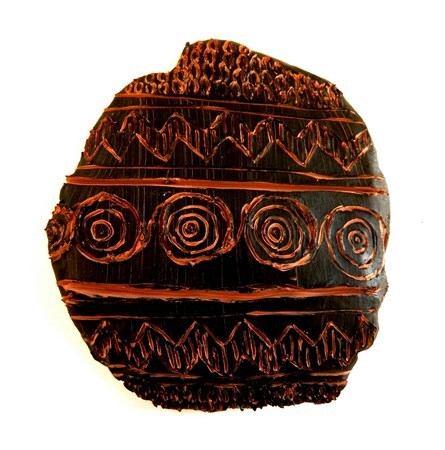 They study a range of artists and stylistic periods during each year, slowly progressing through art history. They study paleolithic art and make cave drawings, Egyptian art and make paintings on papyrus, Greek art and make black figure vases out of paper maché, Impressionism and paint their own "Starry Night," etc. Third graders make still lifes using color schemes. Fifth grade, Huebel says, seems to be the earliest age at which students can handle 2-point perspective drawing. Naturally, this corresponds to a study of the Renaissance. As fascinating as some of the projects are, and as beautiful the results, I wouldn't describe any of the projects we could see as overly challenging. The criteria were simple enough, and the projects creative enough, that the children seemed to take up the challenges and really flourish in them. 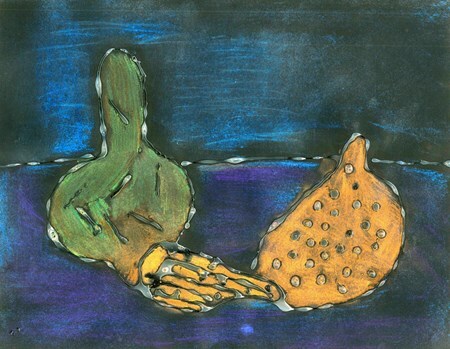 Huebel uploads the children's work to Artsonia, an online kids' gallery where students are assigned an anonymous number so that their family and friends can see their work, but their information isn't shared. To see some of the 8,700 some works produced by MLCA students since 2008, see their Artsonia gallery. If your jaw is not on the floor right now, you maybe haven't had any experience with "art" in a typical Lutheran school. Even though I worked really hard at art class, I learned little more than the kids who still struggled with scissors and glue. Sitting through this presentation, though, I thought to myself, This must be what art classes are like in heaven. (Except that in heaven, Jesus would be your instructor, art class would take the entire day—minus a one-hour lunch break, and go for five days a week, for 1,000 years.) But seriously, look at this classroom. You immediately become a better artist just by walking into the room. So in conclusion, if you don't think the state of art education in the WELS is all that bad, here's an objective point of comparison. If most of our WELS schools had art programs half this good, I would have nothing to complain about. So if you think your school's art program could do better, I think the program at MLCS is an excellent example to emulate. Bravo, Mrs. Huebel! Keep up the good work.